Join us for the exciting, fast-paced morning networking event, Direct Connect! Our networking format is designed to help you initiate meaningful, strategic conversations within moments of meeting a new connection. We want to help you expand your network through Direct Connect. Registration, breakfast and open networking begin at 7:30 a.m., the program begins at 8 and ends at 9. Upon arrival, attendees are given a rotation schedule for four rounds. Participants will take a seat at the assigned table for round one and have 60 seconds to tell the rest of their table about their business. Once each person at the table has had a chance to speak, the table will be open for conversation until the round is complete. The emcee will announce the completion of each round and participants will move to a new table to begin again with a new set of connections. This format allows participants to engage in conversation with more than 20 other attendees and allows for maximum exposure of each business during the event. Watch the video to learn more and see the event in action! *Is it your first time? Contact Alexander Helgar at (469) 326-7454 and we'll cover your ticket as the Chamber's guest! Members and Non-Members who attend the event as a walk-in will incur a $15 fee. Because of facility requirements, we must charge the full registration amount ($15) for reservations not canceled two business days prior to the event. See our fee policy for additional details. 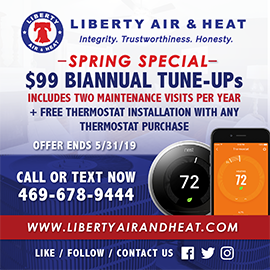 Founded on integrity, trustworthiness, and honesty, Liberty Air & Heat provides HVAC services throughout DFW. You have the Liberty to live comfortably.